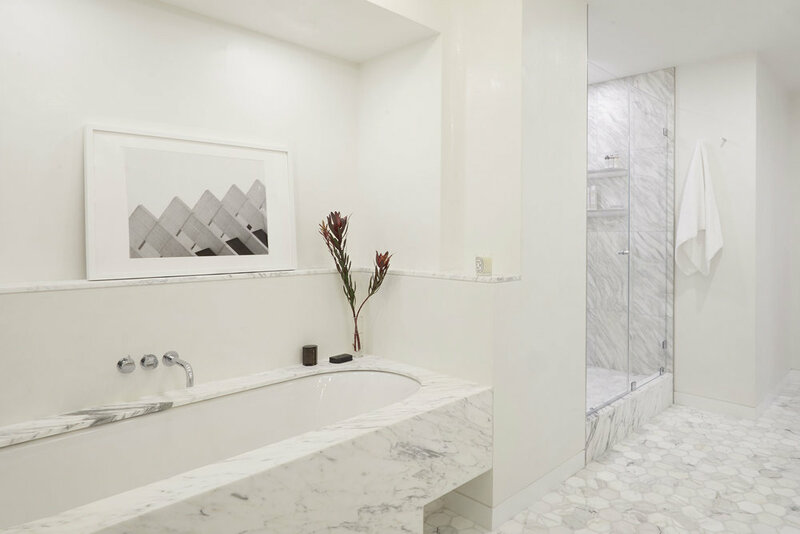 A stone’s throw away from Central Park in Manhattan’s exclusive Upper East Side, architecture and interior design firm Frederick Tang Architecture have created an expansive and elegant apartment for a three-person family and their dogs. 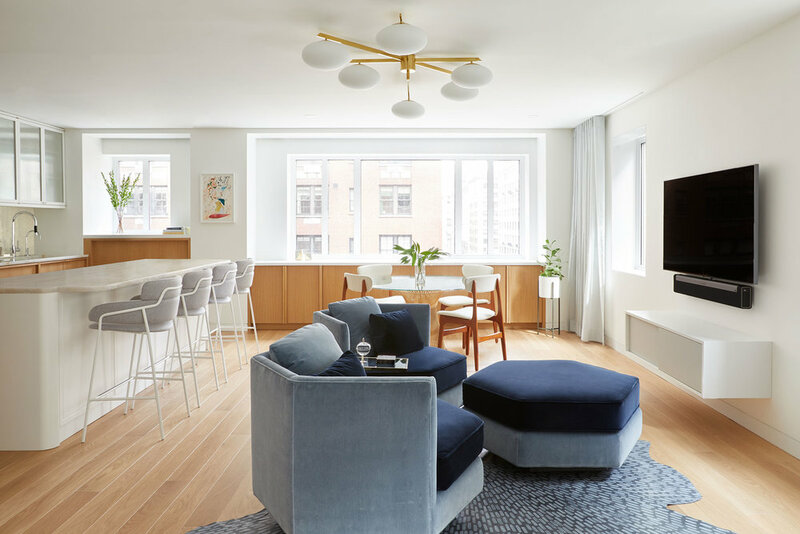 For this project, the designers undertook a complete gut renovation, combining two units in a post-war co-op building to create an apartment imbued with Art Deco, mid-century and 1970s design inspirations. This distinctive style was directed by the female client who ‘loved anything in black and white, navy or purple, and a little sparkle and glamour. In contrast, she appreciated a clean aesthetic and modern lines. The result is a fusion of the 70s open-plan concept, Deco opulence and materiality, and mid-century iconography,’ explains Frederick Tang, Principal at Frederick Tang Architecture. The apartment is characterised by large, open spaces which flow effortlessly into one another, and several curved walls and rounded bays. The home needed to suit the family’s varied lifestyle, so the designers introduced a series of subtle design elements that can be used to create multiple rooms or ambiances. 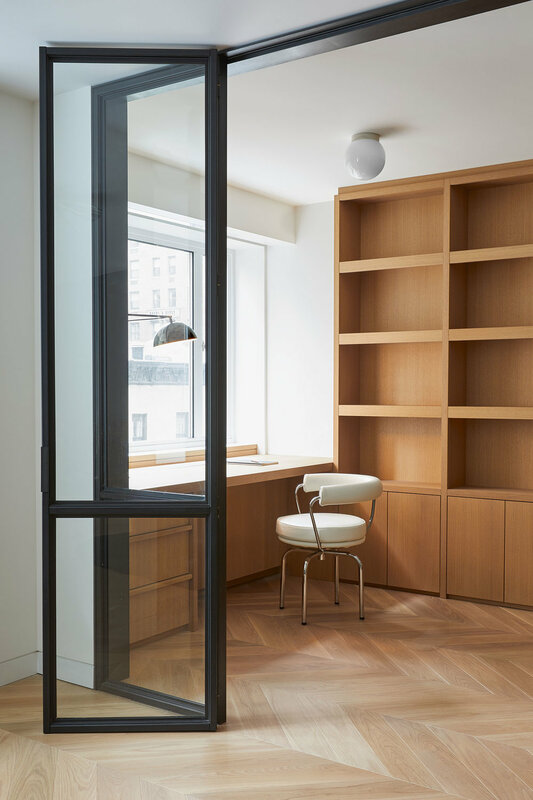 As the clients occasionally work from home, the study’s steel and glass framed doors fabricated by Habiterra offer privacy but continue the apartment’s extensive length. The family also needed an open space for entertaining, with areas that could be closed off for the children’s play dates. Midway through the project the client requested the inclusion of a television, which is cleverly hidden behind millwork and hinged swing doors above the stone fireplace. The entrance boasts stunning Art Deco-style stonework. ‘The clients wanted an impressive foyer that diverted from the chevron oak throughout the apartment. 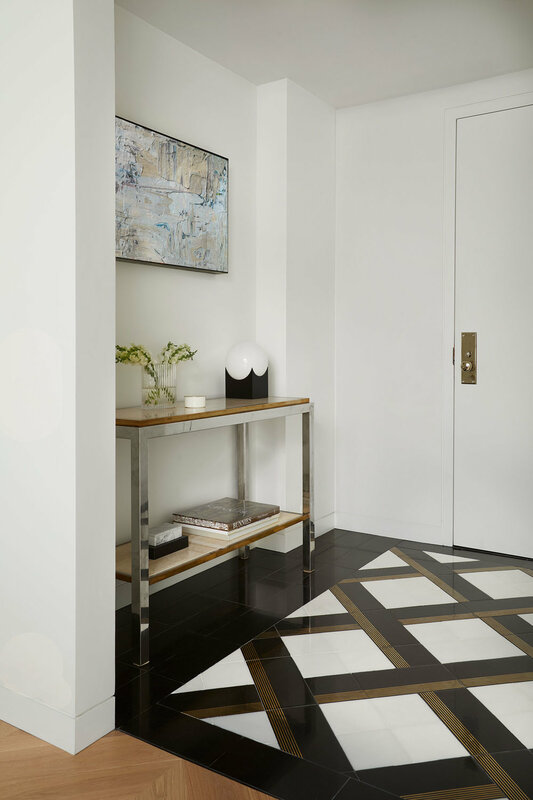 Influenced by their affinity for black and white, we designed the compact entry in an Art Deco geometric pattern with stone tile from ANN SACKS. To do this, the stone was placed on a diagonal with a basket weave of brass inlay that created movement as it lay under and over one another,’ shares Barbara Reyes, Director of Design at Frederick Tang Architecture. The design gene has clearly passed down to the clients’ daughter, who also had a clear vision of her ideal bedroom. ‘She was inspired by a vintage 60s image from Knoll, complete with Saarinen furniture and playful patterns,’ Reyes explains. A queen platform bed has surrounding seated areas perfect for sleepovers and hanging out. The room’s key motif is her favourite animal, the sloth, most obvious in a custom light fixture by Lite Brite Neon Studio, while custom Maharam leather and Paul Smith dot and plaid cushions offset the wallpaper and hidden storage. One of the most endearing elements in the apartment is Chili and Waffles’ own doggie spa. 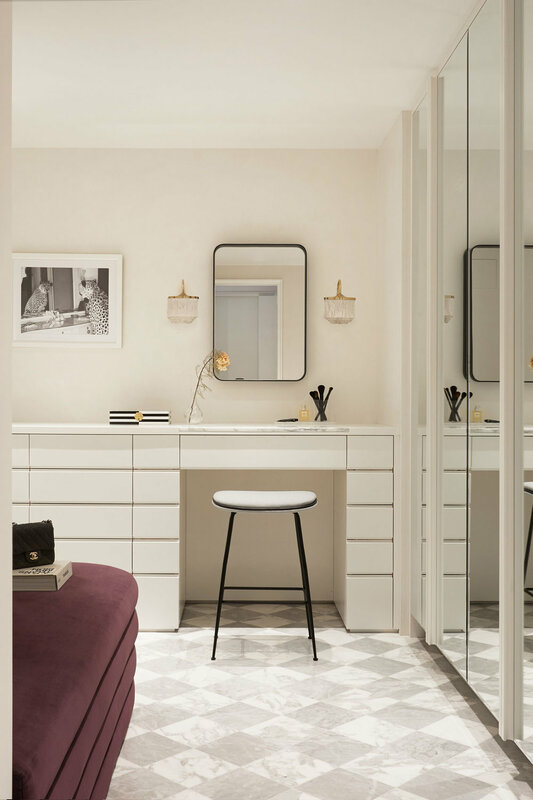 The service bathroom has a tall but shallow shower and sink area, and the designers give a playful nod to classic New York City pre-war co-op bathrooms with a basket weave mosaic of Carrera and Nero Marquina. 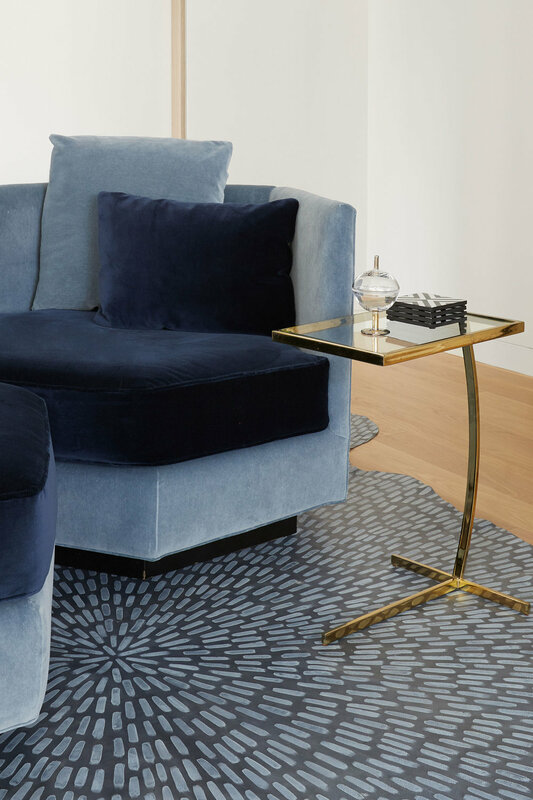 A neutral colour palette with accents of ‘varying shades of ink’, including blues, black and purples, transforms the apartment and is complemented by a luxe materials palette. Several types of striking stone feature throughout the home, from the fireplace in quartzite by Antolini in Elegant Brown, with its dramatic caramel, charcoal and ivory veining, to the grey and white checkerboard floor in the master bedroom closet. White Oak flooring from MADERA is accompanied by a mix of polished nickel, chrome and brass lighting and furniture. Taken as a whole, the home is a masterful confluence of design inspirations that reflects unique and sophisticated sensibilities.